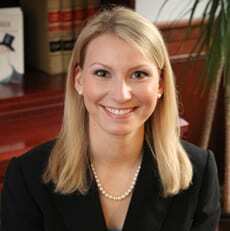 Sarah S. Healey is a partner in Carmody Torrance Sandak & Hennessey’s litigation group. Sarah focuses her litigation practice in the areas of business and commercial litigation as well as labor and employment defense. Sarah has represented a variety of clients including financial institutions, insurance brokerage firms, healthcare facilities, utility companies and individuals in federal and state court as well as in arbitration proceedings. Sarah has represented clients in a range of matters involving, for example, claims of employment discrimination, harassment and retaliation, wrongful discharge, breach of contract and fiduciary duty, defamation, unfair trade practices, and misappropriation of trade secrets. Sarah also regularly defends employers before administrative agencies such as the Equal Employment Opportunity Commission and the Commission on Human Rights and Opportunities. Sarah frequently presents on current labor and employment law issues. She also conducts management training for all employers on topics including harassment prevention and performance management, leaves of absence, accommodating employees with disabilities, and wage and hour compliance. Seminar: What Does the New Federal Overtime Rule Mean for Non-Profit Organizations? Former Board of Directors, Acts 4 Ministry, Inc.